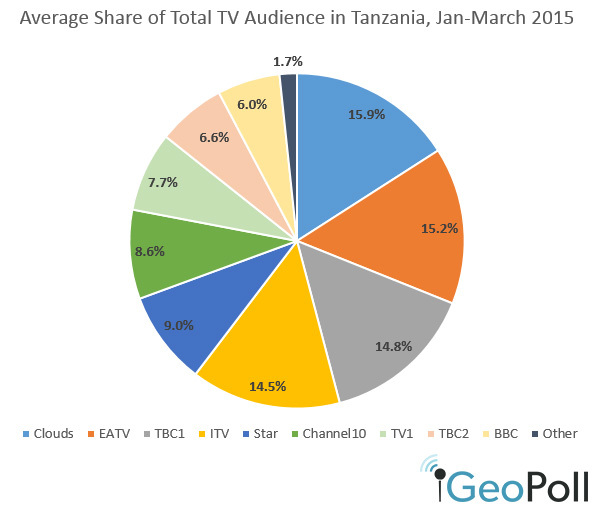 Using the daily data collected through GeoPoll’s Media Measurement Service, GeoPoll has analyzed the top TV stations in Tanzania for the first quarter of 2015, from January 1st – March 31st. We examined both ratings* and share** for the top stations in Tanzania. The below chart shows the average ratings for the top 5 channels during peak viewership, from 7:00pm to 9:30pm. 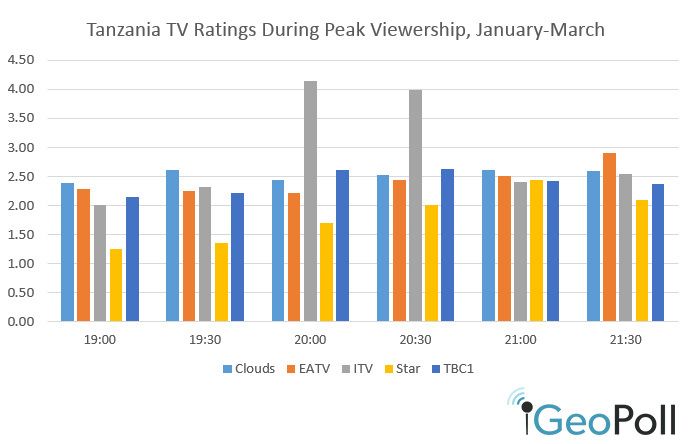 As displayed in this chart, the 5 most dominant TV stations, ITV, EATV, Clouds, Star, and TBC1, are fairly even in terms of ratings during prime time, with a few exceptions. This is in contrast to Uganda’s top TV stations, where just two stations, NTV and Bukkede, dominated the ratings during prime time. From 7:00pm-8:00pm, ITV, EATV, and TBC1 show similar ratings on average. Clouds leads them slightly, with an average rating of 2.39 at 7:00pm and 2.6 at 7:30. Star lags behind, with an average rating from January-March of 1.26 at 7:00pm and 1.35 at 7:30pm. From 8:00pm-9:00pm, ITV shows a strong jump in ratings, with an average rating of 4.14 at 8:00pm and 3.99 at 8:30pm. During this time, ITV airs their nightly news show, “Habari”, which translates to “news” in Swahili. At 9:00pm all 5 channels again have similar ratings, around 2.50. 9:00pm is also when Star had their highest average rating from January-March, with a rating of 2.44. EATV has their highest average rating at 9:30pm, at 2.91.